I wanted to see an actual coal train, its open cars heaped with fossil fuel, and to inhale a wave of coal dust as the train meandered past me. But the closest I came to any of that was near a filling station in Washington state’s Nooksack valley. Standing at the pump, I soon heard the diesels thrumming nearby as a Burlington Northern Sante Fe (BNSF) locomotive with its line of cars rolled through the rail crossing with who-knows how many cars in tow. No, it wasn’t a coal train. In fact, the future multi-use marine terminal — Gateway Pacific Terminal (GPT) at Cherry Point near Blaine, Washington—is on a snap line some thirty-six miles west from where I stood; it won’t be operational until 2015. Still, it was Mr. Buffett’s locomotive and freight cars. He purchased the BNSF in November of 2009 for $44 billion. Pundits said it was his future bet on getting coal to Asian markets via the GPT terminus. The latter is being developed by companies touched by Buffett via Goldman Sachs, which Buffett has an equity position in. When Buffett purchased BNSF, coal was at $86 per metric ton. It peaked at $141 in January 2011. Ironically, that price was reached just a couple of months after he and Bill Gates paid a visit to President Obama. There, in the Oval office they pushed a jobs agenda whose bedrock was coal. Some might conclude that the visit with Obama was a death knell for our languishing EPA, who was about to add some heft to regulations aimed at reducing mercury emissions from coal-fired power plants. Not. Instead, the visit with Obama resulted in opening up a mother-lode of coal in the basin. The amount of coal is projected to top 2.4 billion tons when fully mined. On the flip side, that cache has a potential of adding carbon emissions tantamount to 300 coal-fired generator plants. By default, the other winner that day happened to be Peabody Coal, the largest coal producer in the world. They will benefit hugely as well since they operate strip mines in the Powder River Basin. No one knows for sure, of course, but if the price of coal was peaking, maybe Buffett saw ‘green’ in the way the BLM priced its coal in the past. More often than not, the BLM was on record as pricing it’s public-land coal way below fair market value. Nationwide, the BLM was known to have used only a few comparatives to determine price; or, in some coal states, where the price hadn’t been adjusted for inflation for five years or so, that’s all that was done to arrive at a pricing model; this, according to a report released by the GAO in December, 2013. Simply put, as noted in that report, the exporting of coal to Asia (China-Japan and India) through yet unbuilt infrastructure will contribute untold phantom costs to coal’s price-per-ton. Admittedly, says the BLM, oversight is needed to price the coal fairly, and it hadn’t happened since the 1980s. In fact, private companies, like Peabody and Arch Coal, were making hay at the U.S. taxpayer’s expense from the BLM’s low-priced coal. Consequently, winners utimately included China, who benefited by importing coal bought on the cheap, which only bolstered the bottom lines of foreign manufacturers. In short, the sale of “undervalued” coal from public lands, under the auspices of the BLM, has been going way too long. The GAO noted how this misstep has cost taxpayers over $100 million. But those government leases on public lands, including Montana, Colorado and Utah, provide about a billion-dollars yearly to private mining companies who were lucky to get in on the deal. 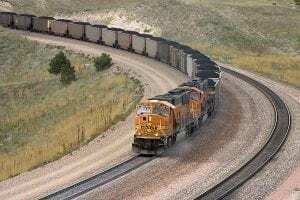 If the private coal companies, and BNSF, are planning on being in the coal business for the long haul, the good news is that this fossil fuel will be around in the U.S. for the next 190 years, according to the Energy Information Administration (EIA). Indeed, the move away from coal, and towards alternative sources of energy, could turn out to be a very long and winding—and dirty— road to follow.